The 2019 Executive Committee and Board of Directors are excited to announce that Amy Ables of AJA Association, LLC, will be the new Association Executive of BOMA Austin, effective immediately. Many of you may know Amy from AAFAME (Austin Association of Facility & Maintenance Engineers) as their Executive Director for the past 15 years. Amy is not leaving AAFAME, but instead, will serve as conduit between the two organizations who have similar goals and objectives. Amy's specialty is engaging members and implementing processes, as well as successful event planning. In her spare time, she likes to travel in her RV with her husband and four dogs — they are on a mission to visit all 90+ Texas State parks! One of her favorite references is the "21 Essential Ways to Achieve Wealthy & Long Term Success". Being successful is not about the money but about living life right! Contact her at amy@bomaaustin.org to say hello, or even better, stop by our luncheon next Thursday, Jan. 17, at the Norris Conference Center. Register here. Join us January 17th for the 1st Luncheon of 2019! All too often sales reps lead off a sales meeting with their features and benefits. Although this is well-intentioned, it confuses the buyer and makes you sound like everyone else. Whether you are selling to potential tenants or services to a property, a better discovery meeting serves both parties by making the sales process more meaningful. Registration is closing soon for our first BOMI Course of the year. Budgeting and Accounting features applications and problems you can use to create building and facilities' budgets. In this course, you will have the opportunity to apply concepts within the real property and facilities context. You will follow the accounting process and creation of a budget from start to finish, learning valuable skills such as how to interpret financial statements, annual reports, and statements of cash flows. You will also learn practical skills such as how to compile lease abstracts and prepare rent rolls. The course includes valuable exercises pertaining to computing productivity ratios, depreciation, ending cash balances, preparing income and expense budgets, and explaining budget variances. Photo courtesy of Jennifer Choi, Allie Coffey, TIER REIT. TIER REIT hosted their Annual E-Recycling Drive at their property, The Terrace, on November 8th, 2018. 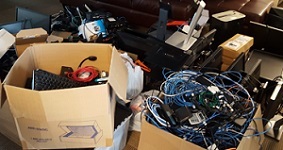 They collected 1,985 pounds of recyclable items including monitors, computers, cables, toners and miscellaneous electronics from their tenants. This means that these items were not put into a landfill but rather recycled or reused! TIER REIT partners with Global Material Recycling to host this event for their tenants. The Terrace, four office buildings totaling 619K SF, is a master-planned development that is nestled amidst the prized Hill Country terrain and protected Barton Creek greenbelt.